Apple iPad 3: An October Surprise? 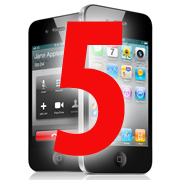 The still-unacknowledged iPhone 5, expected to make its debut in October, is now expected to sport a metal back instead of glass, and its screen size will not exceed 4 inches, contrary to earlier reports. Instead, the next iPhone will have a display size between 3.5 and 3.7 inches -- the current model has a 3.5-inch display -- and may also have a thinner bezel along the sides of the device to make the screen look larger than it actually is. Other than those changes, the next iPhone is not expected to be remarkably different from the iPhone 4, sources inside Apple's supply chain have reportedly told Taiwan-based DigiTimes. Suggestions the next iPhone would have a 4-inch screen have been circulating for some time. In February, DigiTimes claimed the iPhone 5 would have a 4-inch screen, and a similar report followed a month later in the China Times. DigiTimes is apparently backing off its original report, and now says the next iPhone's display will not be much larger than the usual 3.5 inches. Some Apple watchers have expected the iPhone to enlarge its screen size to offset competition from rival Android handsets that usually have displays measuring 4 inches of more. Some of the most popular and critically acclaimed Android handsets have 4-inch-plus screens including the HTC Thunderbolt, Motorola Droid X, and the forthcoming Galaxy S II. Several Windows Phone 7 devices also have larger displays than the iPhone, including the HTC HD7 and the Samsung Focus. Smartphones debuting at the IFA Berlin trade show that begins this Friday are also expected to trend toward displays measuring 4 inches or more. Smartphones sporting screens larger than the iPhone have been available for some time, and Apple has yet to follow suit and enlarge its marquee device. But Apple may yet flirt with enlarging its screen size. Various reports suggest the next iPhone will have an edge-to-edge screen, upping the display measurements by a few tenths of an inch. Those earlier claims fall in line with DigiTimes' current stance that the iPhone will have a smaller bezel that could make its display size as large as 3.7 inches.